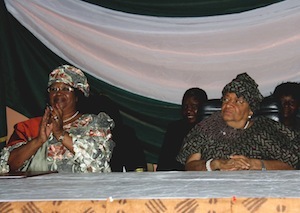 MONROVIA, May 9 2012 (IPS) - The only two female heads of state in Africa, Liberian President Ellen Johnson Sirleaf and Malawian President Joyce Banda, have just committed to using their positions to improve the lives of women across the continent. Both Sirleaf and Banda have long championed women’s rights. And on Apr. 29 in Monrovia, two years into what the African Union (AU) has declared the “Women’s Decade”, they pledged to work together to accelerate those efforts. “Today is a day African women must rejoice,” Banda said as Sirleaf stood by her side. “This is our day. And this is our year. And this is our decade!” And Sirleaf affirmed her – and Liberia’s – commitment to empower women. “The two of us have great strength,” Sirleaf said. “Together, we can do more to empower women and to ensure that women’s role in society is enhanced.” She added that her country would work with the new Malawian government to advance women’s empowerment. To be sure, the challenges before them are great. Using the United Nations Millennium Development Goals (MDGs) as a barometer, Liberia and Malawi generally score low in the areas of gender equality and women’s empowerment, education for girls, and maternal health. "A New Dawn Rises over Malawi"
But as Banda noted during her speech, there has never been a better time to advance women’s rights in Africa. Sirleaf, a Nobel Peace Prize winner, was elected as Africa’s first female president in 2005 and reelected in 2011. While her first term in office focused on reconstructing a country devastated by two civil wars, one from 1989 to 1996 and the second from 1999 to 2003, she has set out to use her second term as president to make women’s rights and health a national priority. Banda succeeded former President Bingu wa Mutharika after his sudden passing on Apr. 5. After she was elected vice president in 2009, she had a falling out with Mutharika, and was subsequently expelled from the ruling Democratic People’s Party and essentially barred from participating in government. However, she remained vice president, and in 2011 she formed the opposition People’s Party. Since Mutharika’s death a number of MPs have left the former ruling party to join her. Both Sirleaf and Banda govern countries with significant development challenges. So devastating were Liberia’s civil wars that nearly a decade since the end of the conflict, the country is still in a state of reconciliation and reconstruction. In Malawi, Mutharika’s last years in office were characterised by an economy crumbling under government mismanagement, which was compounded by the withdrawal of donor aid because of human rights abuses. At her office in Monrovia, Liberian Minister of Gender and Development Julia Duncan-Cassell described advances in women’s empowerment as observable through representation in government, as well as in ordinary women’s participation in the democratic process in Liberia. On education, Duncan-Cassell pointed to figures indicating that the ratio of girls enrolled in school continued to climb towards parity with boys. The 2010 UNDP report on Liberia and the MDGs confirms this, noting that the ratio of girls to boys receiving a primary education stands at 0.88 to one, and for secondary education, 0.69 to one. The document states that Liberia is on track to achieve its targets on girls’ education. With regard to women’s health, Liberia’s five-year “Road Map”, launched in March 2011, aims to “halve Liberia’s high rate of maternal and newborn death” and calls for “increasing the number of skilled birth attendants at all levels of the health care system by 50 per cent.” According to the country’s 2007 Demographic and Health Survey, Liberia’s maternal mortality rate is 994 deaths for every 100,000 live births – one of the highest in the world. She has strengthened the voice of women in government through the appointment of eight women to senior cabinet positions. She has assigned women to the positions of deputy chief secretary to government and deputy director inspector general of police. And she has advanced women’s economic empowerment through the introduction of an agricultural programme and a market initiative. And with the presidential initiative on maternal health and safe motherhood that is still to be launched, she admits she is following in the footsteps of Sirleaf. “This one, I learned from my big sister,” Banda said. “I fully embrace the pronouncement,” she said in a telephone interview from Johannesburg. “It is wonderful news to hear that President Banda and President Sirleaf have prioritised the African Women’s Decade and (have agreed) to work together to advance women’s rights.” Musyimi-Ogana added that on behalf of AU Commission head Jean Ping, the organisation pledged to make its top representatives and resources available to Sirleaf and Banda, to accomplish the goals of the AU Women’s Decade. Meanwhile, Banda said that she believed her responsibility for ensuring women’s rights extended beyond Malawi. Duncan-Cassell also noted that challenges lie ahead. But she maintained that Banda’s rise to the presidency of Malawi was a cause for celebration.